I can't believe we are already headed into the second month of 2017! Does anyone else feel like January flew by? As a new month is about to start, I once again look forward to what new movies and shows Netflix will have to offer. And this February there a few that have got me excited, for vastly different reasons. My family and I saw this in the theaters and absolutely loved it! So I am super excited that now we can watch it whenever we want streaming on Netflix. 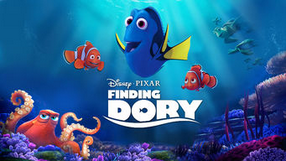 Dory and Nemo will hot Netflix on February 1. OK, this one is all about me, and I think the reasons are pretty obvious. It is quite a visual treat. I am not going to elaborate any fuller on that. Here is the full list of what Netflix is adding in February 2017. Which ones are you looking forward to?